Facets’ Czech New Wave and Eastern European catalogue is like a hit parade when almost no one even realized their was a holiday. They’ve amassed an impressive collection, though they’ve been the object of some controversy amongst cinephiles. Many of their transfers come from terrible prints and it is often apparent that little work went into providing restoration, restoring the proper aspect ratio and proofreading the subtitles. 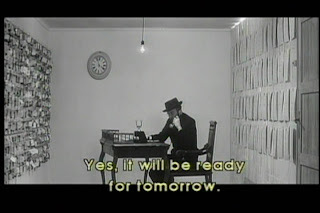 I’ve come across any number of disapproving glares from Criterion and DVDBeaver acolytes, though I can hardly condemn them for at least priming the pump for interest in Czech cinema. Besides, today’s featured film, “The Fifth Horseman is Fear,” is an excellent transfer. Reading about Facets, I was hardly surprised to learn that their CEO has a Czech background. The sheer number and variety of masterpieces they’ve unearthed has few comparisons and you’d almost have to have a special interest in the country to know where all the treasure was buried. This has a large part to do with Czechoslovakia’s unusual political path through history, especially the dramatic shift from the open and creative period of “socialism with a human face” to the extreme suppression following the August 20th, 1968 Soviet invasion. Films were destroyed, shelved and “banned forever.” Many of the best directors fled or were exiled. Those who stayed had to put up with censorship and blackballing. 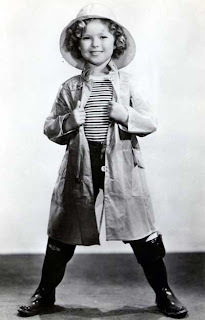 The response from the United States had a fittingly political and cinematic timidity: they did nothing except attempt to extricate Shirley Temple, who was touring Prague at the time. Ironically, she would become the first US ambassador to the Czech Republic during the 1989 Velvet Revolution. “The Fifth Horseman is Fear” was made in 1964, when a thinly veiled critique of the network of informants and the politics of fear was still possible. Director Zbynek Brynych sets the film during the German occupation at an apartment that is sheltering an injured fugitive. 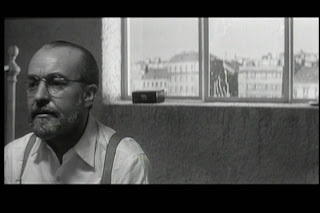 Dr. Braun is a mid-level bureaucrat working at a warehouse for confiscated Jewish property. When we are first introduced to him, he is wandering through cavernous rooms dedicated to furniture, dishware, books, clocks, musical instruments, etc. Like the photos of shoes and human hair from Holocaust camps, they have a devastating impact because of the vast loss of humanity they imply. 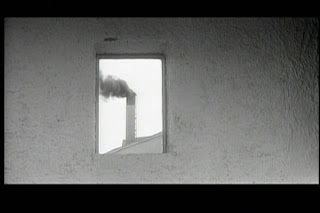 Part of Brynych’s evocative, bittersweet tone comes from the way he films such horror with deft beauty. 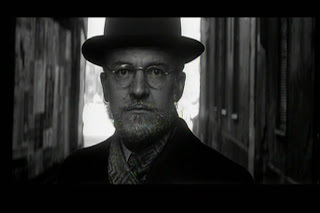 Braun’s character is any many ways an anti-Hamlet, a man whose commitment to a single decision will be his salvation. 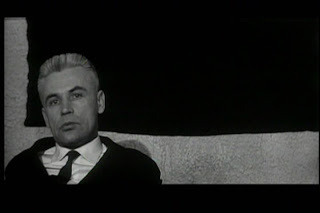 At the start of the film he is not very likable, a somewhat pathetic nobody so dissatisfied and frightened within his adopted life that he suffers from hallucinations. His nightmare voyage through the low-life and high-life of Prague in search of morphine may be far more dangerous than taking inventory of teacups, but it brings his values back into focus. By the time the police search his apartment building for the second time, he is the only tenant to have shed the burden of fear. It is hard not to see Dr. Braun as a coward, a collaborator who has retreated into a cycle of impassive drudgery. 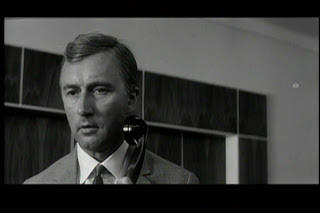 When a tenant of his apartment takes in a wounded freedom fighter Dr. Braun is asked for assistance. As a Jew, he hasn’t been allowed to practice medicine since the occupation. He is nervous, scared and annoyed. Brynych’s approach to fear is unusual. Rather than take the horror movie approach of scaring the audience directly, he shows the presence of fear and the toll it takes on everyday characters. His strategy relies on viewer empathy and contagiousness to spread the sensation, a tactic similar to his subject matter. Though he does dabble in a bit of traditional suspense (most noticeably in the first police raid), his techniques are often more subtle. Frequent returns to a wall full of posters imploring informants to report any suspicious behavior “promptly and accurately” “for your own safety,” along with the way the camera lingers over the traitorous temptation of phones, thickens the brooding anxiety. 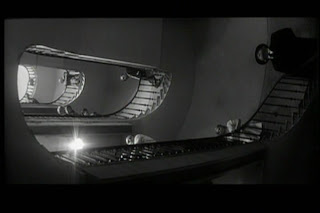 The director also uses visual manipulations to unconsciously signal that something is wrong, unsettling the viewer even during moments of calm. 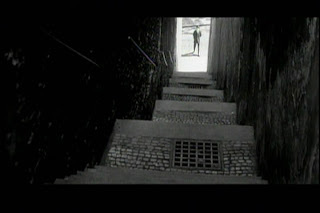 One clear example is his anamorphic widescreen framing (see images below). Brynych’s compositions are his strongest element; they are dry and geometric, but hit with a strength bred from fusing artistic and emotional impact. He is a master of textures, of unobtrusively dropping symbolic stilllifes onto the set and, most of all, of eerily shaping unfilled space. When he wants to destabilize the viewer’s comfort, he destabilizes his perfectionist images, creating unbalanced close-ups for unhinging minds. The way Brynych can pull the carpet of symmetry out from underneath us stands in conspicuous relief to the film’s otherwise precise structure and steady tempo. 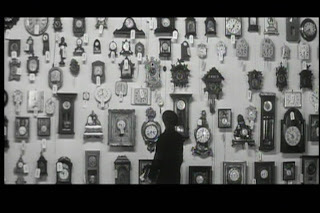 Mirrored scenes and matched pairs become an organizational motif, perhaps in line with Braun’s impeccable neatness. 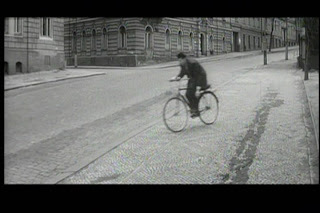 One such doubling is a scene in which a young boy watches a bike rider approach on a wide, empty street. He laughs as the rider comically weaves and stumbles until he gets close enough for us to tell he is seriously hurt. There are no vocals on the soundtrack, only circus music. 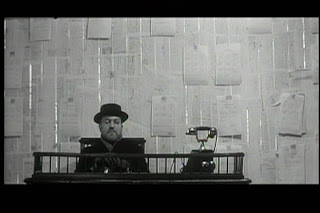 The scene repeats later, with a different rider and new implication. Other pairings include the two police raids and twin visits to Braun’s sterile office, a masterpiece of textural set design in which each wall presents a totally different face, each individually devoid of hope and humanity. 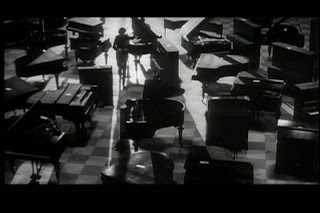 Music also plays an important role in “The Fifth Horseman is Fear.” As the opening credits play, discordant music is given sudden context when Braun enters a vast gallery filled with confiscated pianos. A more relevant motif is the violin, which shows up at the impound warehouse, a decadent party (where it has an amazing classical duet with a cowbell) and in Braun’s apartment. 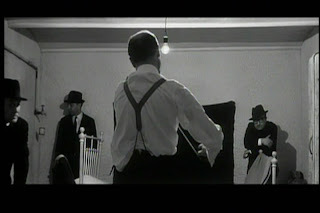 At one point Dr. Braun is forced to play a piece while a police outfit rummages his room. The talent and passion of his music is one of the rare hints about his past, a revelation of the soul that has been slowly dying since the oppression began. “The Fifth Horseman is Fear” is so expertly photographed, so politically potent and so thematically deep that it risks neglecting the viewer on a pure emotional level. Somehow this never happens. Without much dialogue and with little background on any of the characters, their plights still seem real, relevant and engaging. 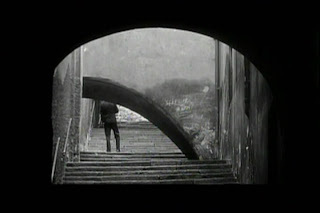 The beauty is stark, but heartfelt; more Bresson than Brecht. 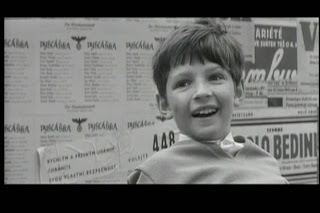 If you can tolerate a gentle rhythm (read: kinda slow) than add this to your list of must-see Czech New Wave flicks. Nice blog, very informative and insightful. What did you think of "What Happens in Vegas ..."
Thanks! The Czech films are definitely growing into a bit of an obsession. Its one area that merits further study and yet I haven't seen a great deal of discussion already out there. It would have been a little too obvious to do a comparison peice between "5th Horseman" and "What Happens in Vegas." The parallels will no doubt telegraph themselves to all viewers without the need for an in depth critical essay. Was Facets the company that released On the Silver Globe? Yup, they've put out quite a bit of East European content in general. Their focus on quantity over quality contrasts a little bit with Criterion, but I think we honestly need both types of distributors (and FACETS is an NPO, so people should lay off). I just cringed whenever I saw an obvious typo in the subtitle script. Like, gimme a few bucks and I'll drive over to proofread the damn things. Sheesh. My biggest problem with Facets' subtitles isn't the sloppy proofreading (which is easy enough to tune out) but the dreadful synchronisation (which isn't). 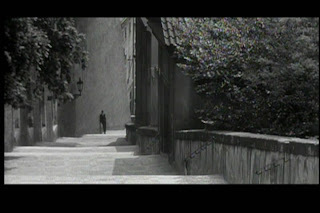 There have been one or two exceptions, but a worryingly large number of their Czech titles have subtitles that run several seconds late, often with the result that a spoken line of dialogue is accompanied by the subtitle from the previous one. At best this is irritating, at worst it makes viewing a genuinely painful experience - and the fact that you can't turn them off doesn't help matters either. Which is why I rank Second Run much higher than Facets - their source materials are often equally poor (an inescapable problem when dealing with a lot of Eastern European materials, as I know from my own experience! ), but they do at least genuinely try to do the best they can, especially when it comes to subtitling. I completely agree. The synchronization is often quite odd and I've noticed occasional glitches where a line of dialogue will flash very briefly before immediately being overtaken by the next one, making it virtually impossible to catch. Do you speak any East European languages that help you circumvent these troubles? The one good thing I will say is that at least they are usually yellow. I recently saw "The Party and the Guests" on a really bad VHS where the white subtitles disappeared completely into the overexposed transfer. I'm planned to buy the Second Run DVD and rewatch it. And yes, I do absolutely adore Second Run and I plan to buy pretty much their entire collection, but my American dollars mean so little to you Brits (darn exchange rates!). Still, they are an amazing value any currency. Has the Sci-Fi Genre Been Robbed of Oscars?